To celebrate National Youth Week, the City of Melbourne commissioned curator, art-historian and writer Sophia Cai to curate an exhibition in the City Library's gallery. 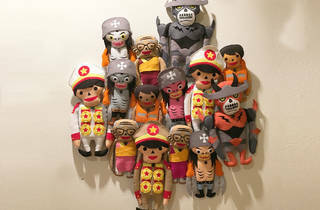 The result, Playful, is a delightful and fun exhibition, gleefully celebrating play, imagination and nostalgia. 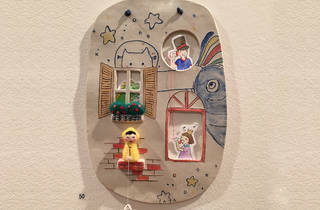 It’s an egalitarian exhibition – all works are super affordable (ranging from $4 to $800) and it’s appeal is broader than just the art community – crafty folk will get a kick out of it, as will kids, families and curious peeps at the library. 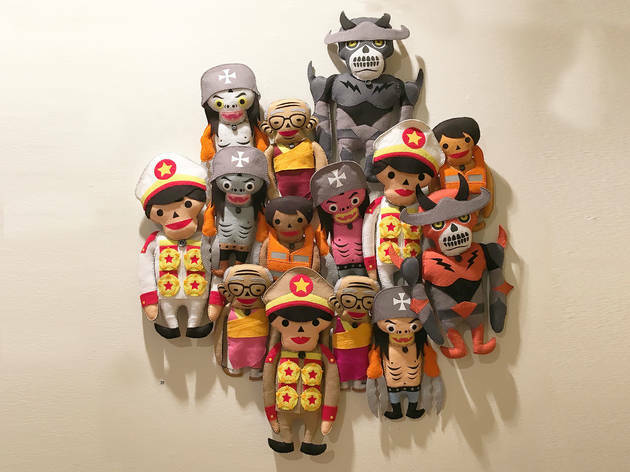 Featuring 18 artists (12 Aussies and six international) including beloved Melbourne artist, illustrator, designer and author Beci Orpin, the exhibition represents a playful list of works, which are a mix of soft sculpture, textiles, toys, animation, illustration and ceramics. 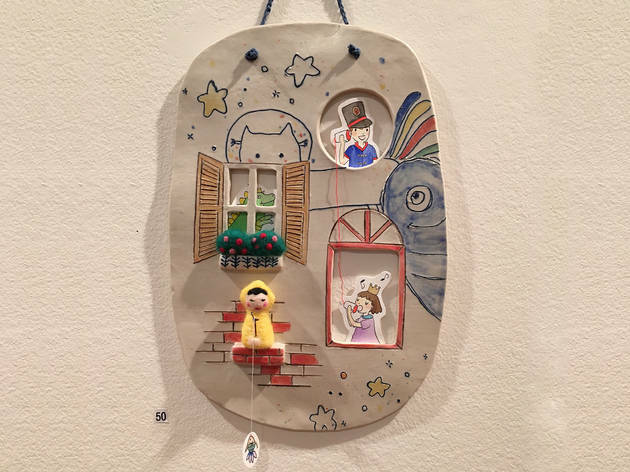 Highlight pieces include Spanish artist Misako Mimoko's sweet, cheerful kites – old school cloth kites, anthropomorphised with big eyes and smiles, hanging in such a way as to look at each other fondly. They're also a wee bit grubby – Mimoko has used vintage, water-stained fabric, which lends itself to the notion that the kites have actually been played with. 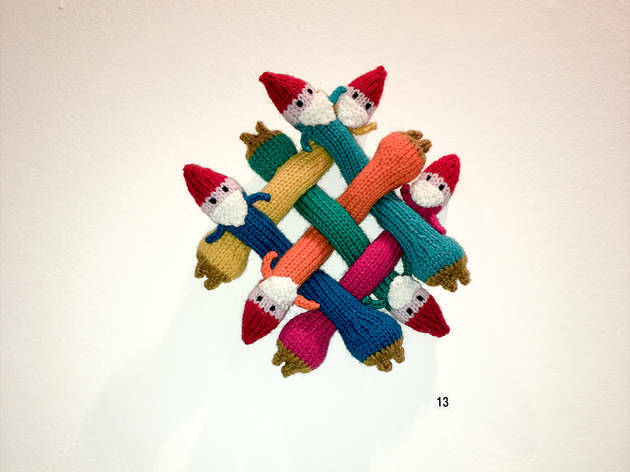 American artist Anna Hrachovec's knitted gnomes are a hoot – they conjure up images of traditional Danish Christmas decorations, but the some of the pieces are wound into more modern configurations – including a double helix. 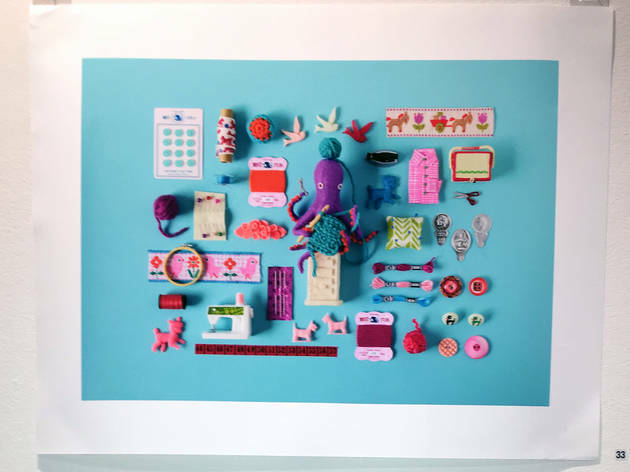 Cai nominates Rosaleen Ryan’s vending machine as one of her favourite works in the show. The vending machine stocks tiny works by Ryan, as well as the other artists in the exhibition – and they’re available for between $4 to $8. 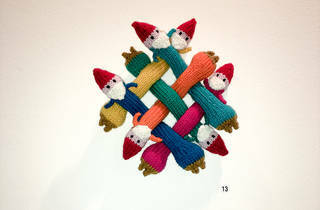 “It’s added an element of interactivity to the exhibition,” Cai says. “It was a challenge – at a show about play, you want people to be able to play, but it’s hard to facilitate that in an arts’ context. 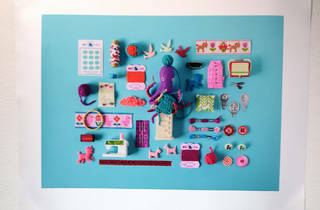 It’s also made it very accessible for people to come and buy an artwork. It’s been great – we had teenagers at the opening who had coins and could buy a small object to take home." Pop down to the exhibition this Saturday (Apr 16) and turn your hand to art with two of the exhibiting artsists for free – Holly Leonardson and Kenny Pittock. Leonardson's workshop kicks off at 11am, during which participants will make an oversized pendant, using repurposed, old jewellery. Pittock's workshop starts at 1pm and is an illustration 101 where participants will learn how to convert characters from their favourite movies and books to paper. Good for ages 15 plus and levels of skill.